try out to stencil with us! Problem to open stuck paint tube cups? Small, time-saving tips for our everyday! Welcome to our page! 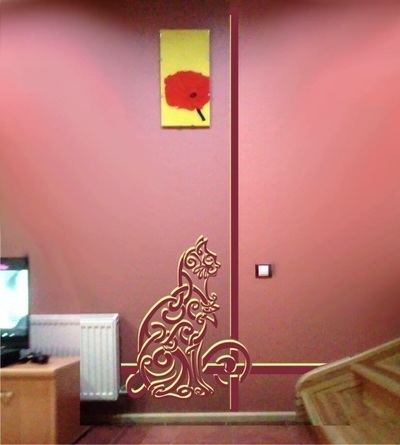 We hope to make our web site more ready some day, so far we try to introduce to some stenciling projects we have realized so far, as well as those designs that we can offer you at the moment. Our page content has been in Finnish language so far but we will do our best to become more international next year, more information in English will be added in year 2016. Please come back soon! We make painting stencils. 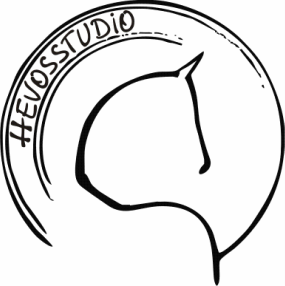 Please have a look at our ready portfolio, we will continue to add new designs. We make custom designs according to our customer needs. Please take a look at some of our projects and do not hesitate to contact us! We got an exciting challenge of what to do with the line problem on the wall? It was a background of two color mix with vertical line between them. We stenciled this wall choosing the lovely Celtic Knot Inspired Cat, thanks to Ms.Patricia Sipes for an opportunity to use her wonderful design! 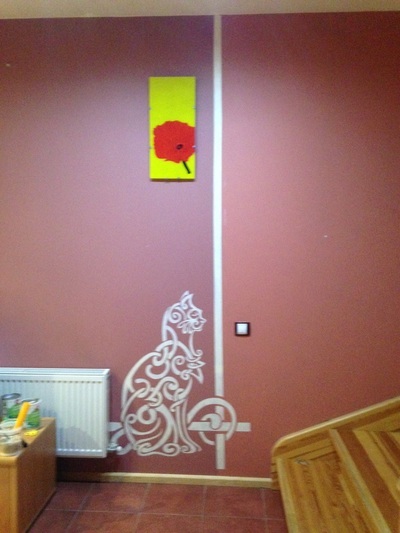 The design includes a long vertical line which was just perfect detail for our wall stenciling project. 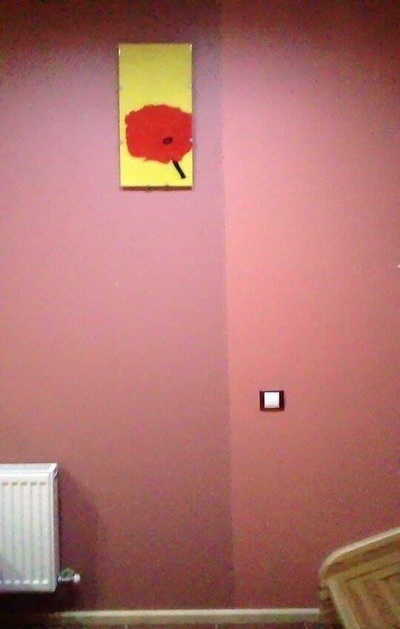 The first picture below is what we got showing the problem of two colors on the wall. The second picture is the sketch with suggestion of the specific design. 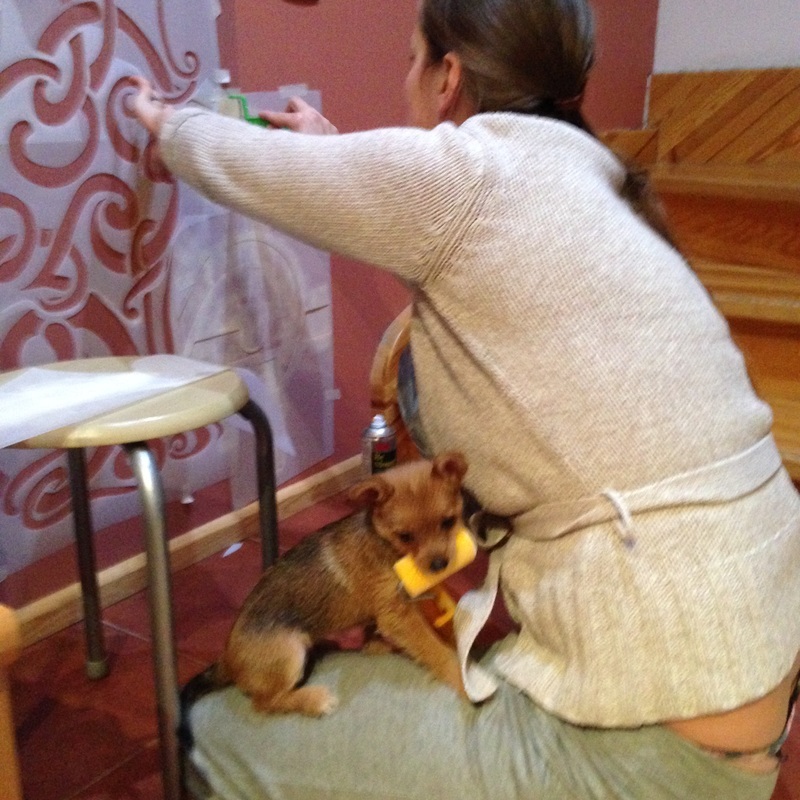 The rest of the pictures is stenciling process getting the design applied on the wall. The pictures showing the application of the first beige layer. The second layer in burgundy red color has been applied by reusing the same stencil. The second layer is applied in few centimeters distance from the beige pattern, this way the light beige tone looks like getting a shadow. ​However, the pattern in one layer looks nice, too. 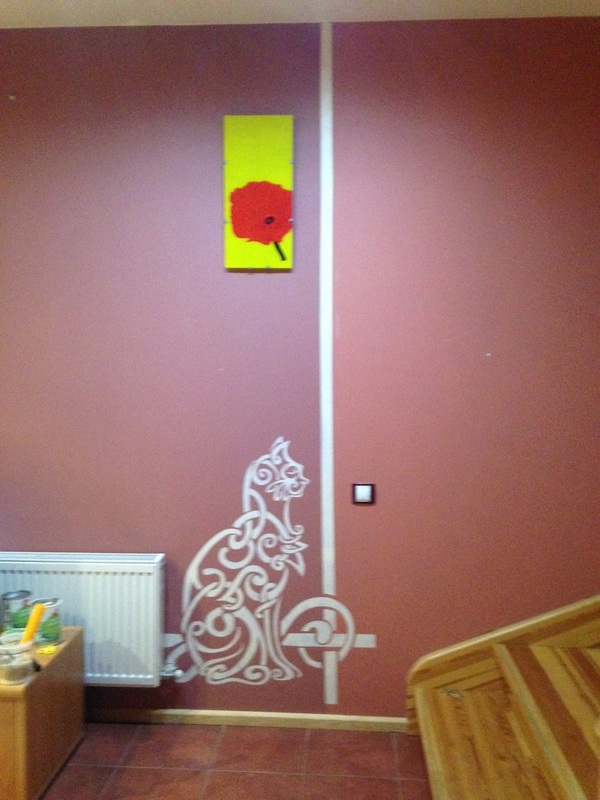 The wall paint was applied using a small painting roller. Please remember stenciling being a "dry brush technique", the paint amount on the painting tool has to be really tiny, it`s important to soak well the paint into the roller, to press out all extra paint remains having roller surface almost dry when stenciling. 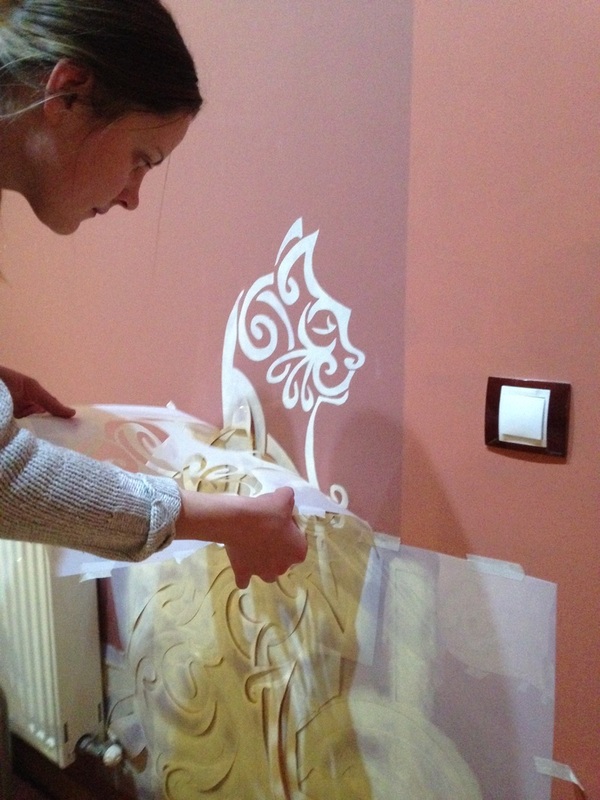 The first layer is thin so we wait until it dries, leaving stencil attached on the wall. After that stenciling is finalized with one more layer, the pattern lines become thicker, sharper and painting is well done Water based colors dry very fast, so stenciling did not take more than just 2 hours, including coffee breaks and social events playing with pets. The preparation and designing work lasted much longer. We hope to inspire for new ideas you, too!